'California Typewriter': A Love-Letter To The Carriage-Return Lever Doug Nichol's documentary profiles the stubborn holdouts — collectors, repairmen, and a few celebrities — who treasure the tactile pleasures of the humble typewriter. 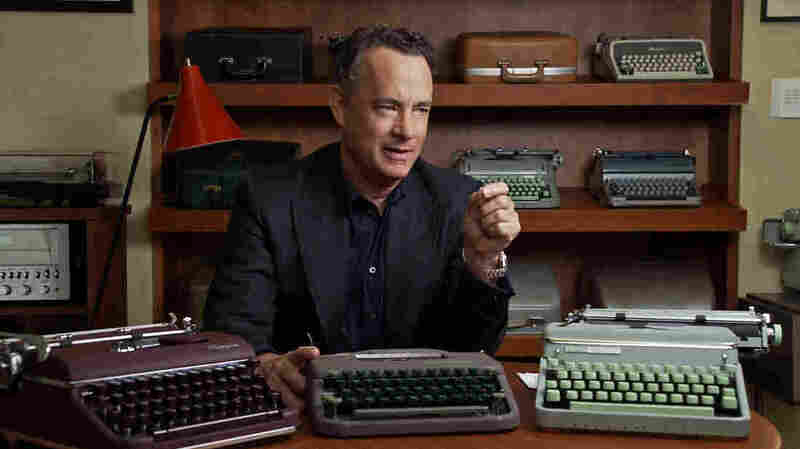 Tom Hanks, one of the interviewees featured in California Typewriter, has over 250 typewriters in his personal collection. The typewriter is a marvelous invention, because with proper care, a single unit can last decades. And if you're still using one now, it would have to: since the mass adoption of personal computers in the 1980s, let's just say the ink on these once-inescapable household items has run dry. The brilliant mechanics, the elegance of pressing a key and leaving an instant, permanent imprint on the page, became obsolete the minute humankind invented the "delete" key. But the very impracticality of using a typewriter in the modern era seems to be exactly what has endeared it to a small but fanatical community of writers and collectors, who praise its tactile pleasures and note the imperfections help to preserve the user's original, pre-spellchecked thoughts. Good news for punch-the-keys loyalists who live in the Bay Area: There's a place for you and your fellow old souls to commiserate. California Typewriter in Berkeley may not be able to patch over the void in the human soul that the computers have carved out, but the shop can repair that oft-abused spacebar on your 1963 Smith Corona. California Typewriter, Doug Nichol's new documentary of the same name, takes us inside this lonely shop, where we meet soft-spoken proprietor Herb Permillion and his longtime repairman employee Ken Alexander. Their plain shelves are lined with typewriters of all eras, and folks love to stop by to enter this time capsule — though not enough folks to keep Permillion from musing about selling the place. But the film quickly feeds the paper, as it were, for a larger meditation on the magic of these physical word processors and a solemn reflection on what gets lost along the forward march of technology. It wouldn't be quite right to call this a eulogy, since the movie is as stubborn as its subjects about making space in the modern world for the humble little typewriter. Yet death and decline is certainly on Nichol's mind. How could it not be, when tomorrow's tech — the very same tech that drove out the typewriters in the first place — has taken over the very region where this lone analog holdout resides? The first experts on the typewriter were women, since they were required to master the skill to fill secretarial roles. So it's curious and maybe a little too revealing that almost all the subjects in California Typewriter are men: a sign about who's willing to take the credit for something only once it begins fading into the rearview mirror of history. At least Nichol wrangles an impressive and broad range of enthusiasts, including America's Dad, Tom Hanks, whose philia is so great he often gives away typewriters from his 200-plus collection to friends. And John Mayer, who rambles a while about how computers inhibit the creative process before checking his phone mid-interview. The late, great Sam Shepard also makes an appearance, admiring the handiwork of his Hermes model from Switzerland. We also get the Boston Typewriter Orchestra, which pushes the frequently cited "musicality" of the tool to its fullest logical extent, and Jeremy Mayer, a sculptor whose pieces are composed entirely of typewriter parts. Mayer takes the machines apart, or scours flea markets for scraps, to make his figurines, which are frequently shaped like sensual females à la Fritz Lang's Metropolis. He weathers sizeable criticism from the typewriter community for destroying the limited number of devices left in the world, but defends his art by claiming what he creates is better than seeing a typewriter sit unused on a shelf for decades. Nichol illuminates these characters with compassion and more heart than you would expect in an ode to a consumer product. These typewriter-lovers come off as sad souls in many ways, but in others they seem to be merely goodhearted optimists, perhaps hoping their beloved noisemakers will stage a sustainable, vinyl-like comeback. And seeing what the fast lane has wrought on the human spirit, there's something tempting in the slowpoke keystroke.